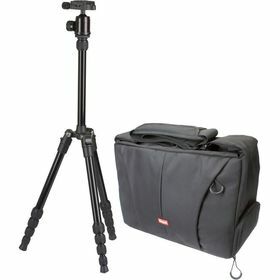 The TravelLite 60 Aluminum Tripod with Camera Bag from Sunpak is a two piece kit which includes a compact 5-section tripod and a black nylon camera bag. The TravelLite 60 tripod remains true to its name with a lightweight aluminum construction of just 2.4 lb. The tripod is also conveniently compact, folding down to only 14.5" to fit into it's companion nylon case. It's 5-section legs utilize twist locks, allowing it to support up to 11 lb, enough for many DSLR's and mid-range zooms. The included single-action ball head is removable and features a quick-release plate for easy attachment. The non-marring rubber tipped feet allow for steady and secure placement and each leg can be adjusted to various angles for uneven terrain or low-angle shooting. The bottom of the center column features a ballast-hook for holding extra weight to increase the tripod's stability. The included nylon camera bag is big in size but light in weight and offers a dedicated pocket for storing the TravelLite 60 tripod. The upper compartment features a generous amount of space for your camera equipment, while the front zippered compartment can hold additional accessories, supplies or just about anything else you may need to carry.